Freshwater lakes and reservoirs, precious resources under tremendous stress, go through a natural eutrophication process, which can be accelerated by development and pollution in the watershed. As more nutrients enter the freshwater system, algae increase, causing the water to become cloudier, warmer, and the dissolved oxygen concentration is reduced. As a lake/reservoir's water quality can be in constant change, monitoring its water quality to maintain its desired state is essential. 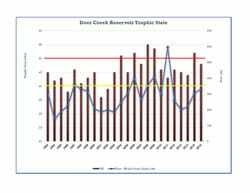 The trophic state index (TSI), developed by Dr. Robert Carlson, is used to measure water quality of a lake or reservoir. It has four general states: oligotrophic, mesotrophic, eutrophic, or hypereutrophic. An oligotrophic lake is a lake with low primary productivity, as a result of low nutrient content. These lakes have low algal production, and consequently, often have very clear waters, with high drinking-water quality. The bottom waters of such lakes typically have ample oxygen; thus, such lakes often support many fish species, like lake trout, which require cold, well-oxygenated waters. Lakes and Reservoirs with a TSI less than 40 are considered oligotrophic. ​Mesotrophic lakes are lakes with an intermediate level of productivity. These lakes are commonly clear water lakes and ponds with beds of submerged aquatic plants and medium levels of nutrients. These types of lakes and reservoirs have a TSI that is between 40 and 50. A eutrophic body of water, commonly a lake or pond, has high biological productivity. Due to excessive nutrients, especially nitrogen and phosphorus, these water bodies are able to support an abundance of aquatic plants. Usually, the water body will be dominated either by aquatic plants or algae. TSI in these reservoirs is greater than 50.